PROPOSED TURNPIKE ROAD FROM NORTHAMPTON TO BEDFORD. George White, who did not appear, was charged under the Master and Servants’ Act, with unlawfully absenting himself from the service of Mr. S. Brooks, Lavendon, into which he entered on the 7th of August. The day following his engagement the defendant absented himself at dinner time and did not return until about four o’clock, when he was intoxicated and very abusive, his absence having caused temporary cessation of work to the whole of the men. —Defendant was ordered to pay damages to the amount of 2s. 6d., and the costs. Mr. A. Horwood, the vaccination officer of No. 2 District, was ordered to take proceedings, under the Vaccination Acts, against James Bamford, of Lavendon, for not having his children, Beatrice Annie and Edith, vaccinated. William H. Haynes, of Lavendon, was summoned for being drunk whilst he was in charge of two horses and a waggon on the 3rd inst. —P.C. Lawrence proved the case. —Defendant did not appear, but sent his wife.—Fined 15/- and £1/3/- costs, in default 14 days. A young man, Charles Wooding, carman, of Castle-road, Lavendon, was fined 5s. for riding his bicycle on the footpath. He told the constable it rode easier. The Rating Committee of the Newport Pagnell Rural Council have excused rates to 42 applicants on the grounds of poverty. The largest numbers came from the villages of Stoke Goldington and Great Linford, six each, with Lavendon next, five. Olney’s new water supply, costing £25,000, and part of the Newport Pagnell Rural Council’s £65,000 scheme for supplying the villages in their district, was formally opened on Wednesday by Lady Bowyer. 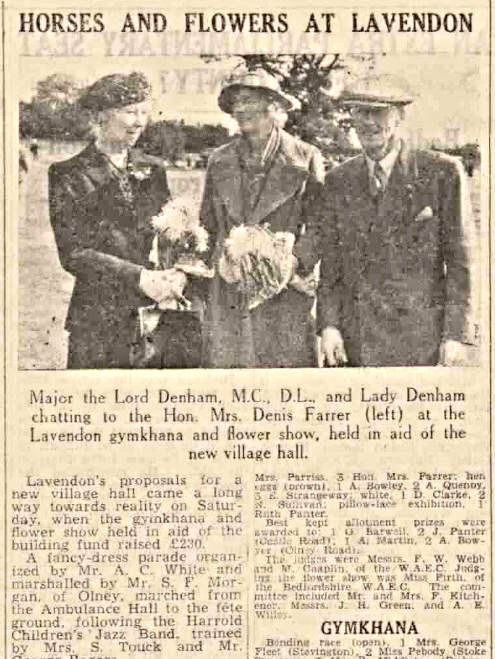 Members of the Council, with their wives and friends, officials and prominent residents of the countryside, gathered at the filter house, Overbrook Spinney, near Weston Underwood. The works here comprise a well and pumping station, reaction tank, lime store and mixer, pressure filters, softened water tank, pump room, workshop and lime sludge beds, together with the charge-man’s cottage. They are situated on the high ground overlooking the Ouse Valley. WATER SOFTENED – Major Taylor explained the scheme for the rural area which comprised a supply at three sources —at Olney, Woburn Sands and Castlethorpe. The first one would supply, in addition to Olney, the villages of Lavendon, Clifton Reynes, Newton Blossomville, Emberton and Weston Underwood. It was so arranged that they could extend their mains to give a supply if required to Ravenstone, Stoke Goldington, Filgrave, Cold Brayfield and Warrington. Sir George Bowyer, M.P., said that the word “Fire” to him was rather a nightmare. Now, with a water supply in the villages, they need no longer have that fear. It was one of the comforting thoughts they could take away with them. Afterwards the Olney Brigade, under Captain A. J. Wiffen, gave a standpipes and hose demonstration in the Olney Market-place, where a large crowd gathered. Water came slowly at first, but with greater pressure a height of fully 30 feet was reached. An insight into the drainage of Lavendon was afforded this week-end when the culvert in Olney Road fell in while the gas mains were being laid. It proved to be built of stone and was only a few inches under the road. The men had to work on Sunday to repair it, as it made things difficult for traffic. A discussion arose on what was to be done with the bier house now that the hand bier had been disposed of, and the Clerk was instructed to interview the owner of the land and report to the next meeting. The need for a proper footpath in Northampton Road was discussed and it was agreed to write to the County Council. Seeing that the water mains have reached Lavendon it was suggested that a tap might be placed in the Cemetery, and the Clerk was instructed to inquire about this. Under the auspices of the Flower Show Sub-Committee of the new Village Hall Fund, prizes for the best kept gardens in the Castle Road and Olney Road allotments were awarded to Messrs. T. Barwell (£1) and Joe Panter (10s.) for Castle Road, and Messrs. A. Martin (£1) and A. Bowyer (10s.) for Olney Road. Messrs. F. West (Castle Road) and S. Odell (Olney Road) were highly commended. 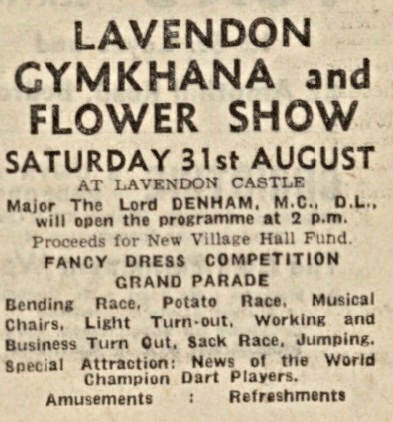 The judging was carried out by the Horticultural Officer of the Buckinghamshire W.A.E.C., [War Agricultural Executive Committee] and the prize-money was given by Major P. Dunn, of Lavendon Castle. Two of four boys, all aged 16, who admitted absconding from an approved school, were also accused of causing grievous bodily harm to Arthur Leonard Bailey, farm worker, 85, Olney-road, Lavendon, on August 17, at Newport Pagnell Juvenile Court. All four boys had previously been found guilty of larceny, housebreaking or burglary. For absconding, one boy was sent to Borstal for two years, and the others given an extended period at the approved school. The two accused of the offence against the farm worker were bound over. Arthur Leonard Bailey said that while cycling along Harrold-road, Lavendon, he saw four boys in field behind a stack. He told them he knew where they came from, and asked them to come out. Two came on the road and the other two went into a ditch. “When they came out I was down on the ground before I knew where I was,” he added. One of the boys tried to strangle him, and the other hit him on the head with his shepherd stick more than once while on the ground. One said: “Put him right out.” Bailey denied having struck one of the boys first. As a result of his injuries, he had to go to Northampton General Hospital. Sergt. J. Turney, Olney, said one boy made a statement that when he absconded he went to a field and picked up some money which he hid there when absconding before. He saw a man who hit another boy with his stick and that boy hit the man back. The other boy stated that the man hit him first and then he hit him several times. “I was in such a temper,” added the statement. Sergt Turney said he examined the boy s back, but found no marks of him having been struck.